Lifelong Ayr RFC member and supporter Ken Blair sadly passed away peacefully in his sleep on June 3rd. A notable figure around Millbrae, Ken could be seen- and heard- every match day regardless of the weather and will be sorely missed by the club. 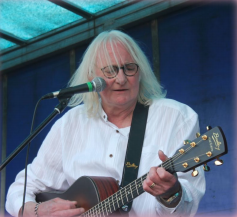 A talented musician, Ken recently wowed the crowds just weeks ago at the Land O'Burns Weekender when he performed on the outdoor stage. Ken's wife, Alison, has extended an invitation to all at the club to attend his funeral and celebrate his life this Wednesday (13/06/18) at Ayr Crematorium, 15.30pm. Alison has also asked us to wear the famous colours of the club that he loved so dearly.